This funny looking fall experiment turned out to be a tasty twist on classic risotto. The pumpkin, parmesan and goat cheese resulted in creamy comfort. Risotto often gets a bad rep for taking a long time to cook, and requiring a lot of patience. I found the experience quite pleasant. I got on the phone with Mama and just chatted and stirred, and by the end of the conversation dinner was ready. Also, farro works beautifully as a replacement for arborio rice in risotto recipes. It feels a bit more exotic, and has more health benefits. If, however, you are attached to arborio rice, or can’t find farro, go ahead and use arborio instead. My only complaint about this dish is that the original recipe said this would make six servings. Maybe six small children? Brent, Marta and I were scrapping the pot for more. Whisk together the broth and the pumpkin in a heavy medium saucepan and simmer over medium heat. Cover the pan and reduce the heat to low to keep the pumpkin broth warm. Melt the butter in a heavy large saucepan over medium heat. Add the leek and 1 teaspoon of the salt. Cook until almost tender, 2 to 3 minutes. Mix in the thyme. Add the farro and stir for 1 minute. Add the wine and simmer, stirring constantly, until completely absorbed, 1 to 2 minutes. Add 1/2 cup of the pumpkin broth and stir until almost completely absorbed, 1 to 2 minutes. Continue cooking the farro, adding the broth 1/2 cup at a time, stirring constantly and allowing each addition to absorb before adding the next. 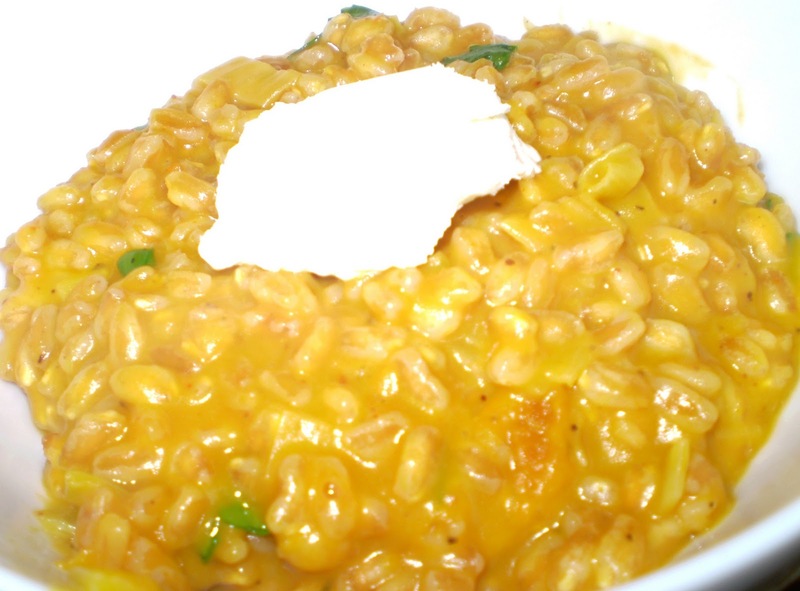 Cook until the farro is tender but still firm to the bite, and the mixture is creamy, 20 to 25 minutes, adding additional warm broth by 1/4 cupfuls if risotto is dry. Mix in the Parmesan, 1 tablespoon of the parsley, the remaining salt, pepper and nutmeg. Remove from the heat. Add more salt to taste. Divide the risotto among shallow bowls. Sprinkle each with goat cheese and remaining parsley and serve. The picture does not do this recipe justice! so good!